In the mail today came a prize from the USA (via Magister Militum in the UK): Jonathan of Palouse Wargaming Journal recently had a competition on his blog, and as the wargaming gods would have it, yours truly was lucky enough to win a prize. To cut a long story short, there are now four more 15mm Carthaginian heavy chariots for me to paint up, which will be just brilliant. Since Jonathan is a master of painting chariots, these will also be a nice reminder of who they came from, and of the kindness of wargamers. Another thing that has been happening the past few days is some paint work on Forged in Battle Seleucid elephants. I'm doing a review for Slingshot, and have been enjoying beavering away at them in the hobby room. Here's where we're at so far. I can see I've been a touch heavy-handed on the drybrushing, but the old magic wash ought to sort that out later! Lastly, over the last ten days or thereabout some books on matrix wargaming have been dribbling into the letterbox from the Book Depository. It's a form I'd like to learn more about and play around with because of its educational applicability. I've already written a little about using games in the ESL classroom, and would like to experiment more. For the last couple of weeks I've been trying to finish off an article on the battle of Thapsus for Slingshot, and it has been a bit of a slog. At about 20 pages in MS Word, it's almost a thesis. It started out as a scenario for Lost Battles, but it's not a simple battle, so I felt I should go into a bit more detail about choices around troop numbers, relative troop quality and so on. Before long, in an effort to explain the numbers, it had become a short history of the African campaign, then an analysis of the differences between the sources, then a reconstruction of the battle that tries to reconcile some of the oddities, and throughout it all a commentary on various problems around the battle. Then it finally gets to the scenario, and variations thereof. Phew. I hope it will be more interesting to read than it sounds. Anyway, I was quite surprised to realise that it's been gestating for about a year - but, come to think of it, that is just about right for a thesis! I had one of those defining-and-not-in-a-good-way life events occur a couple of months ago. I have an American friend who I used to work with over here. A really good guy from Illinois. He has a wry sense of humour and an easy manner, loves the outdoors, and was popular with the ladies in Japan. He left here for another place about fourteen years ago I guess, but we got in touch again through a well-known social media network about eight years ago. He was now married, with two kids, and was teaching at a school in Mexico. In a different era he'd be the kind of person you'd send a Christmas card once a year, with an open invitation to come and stay if he and/or his family were ever coming over your way. Not deeply connected buddies, but friends, and a guy you could pick up with where you left off, and that you'd trust. In the new dispensation though you send a message or two when you reconnect, and from then on interact by 'liking' a photo or post now and then, maybe dropping a comment sometimes, and he does the same to you. I saw some time ago that there was an abrupt shift in images. Gone were the family photos. Instead, there were shots of him in the outdoors, him with his kids, him having coffee with a woman. Wow, I thought, he might've taken up with someone else. I didn't want to pry, so said nothing, but privately I was assuming he must've done a dirty on his wife. Not long after that I posted on this particular social network a link to an article I'd read on abusive partners, and how abuse is not the simple thing those of us who are lucky enough to have good relationships might think it is. I was surprised to see that he'd liked the article. Not many others did. I sort of wondered what his story was. Again though, I didn't want to pry, so said nothing. Anyway, a couple of months ago he posted on this social media network that it should be harder to get a gun in America. I saw the post in real time, thought, 'oh, crap. Must be another nut gone and killed a bunch of people' and told myself I should check the news. I couldn't find anything about a mass shooting in the online papers, but a day or two later it became apparent that there had been a shooting that day: he had gone and shot himself. I'm sure we would all have a pretty similar reaction to that. The thing that got me though was that in this day and age, with this interconnectedness, with social media, with this life in real time online, that a guy could feel so alone that he could go buy a gun, post cryptically about killing himself, have no one pick up on it, have no one go and see if he was OK, perhaps have no one even message him to see if he's OK, and then go and pull the trigger, was an awful indictment of where we as societies are at. I wondered what kind of useful function this social media serves if it can figure out things you might like to buy but blinds you to the things that matter. That it could obscure the fact that a friend is hurting, leaving him only feeling able to communicate that hurt by arcane signs, such as a change of profile images, or a pregnant 'like,' until the final decision is made, and when it is made, and in this case posted, perhaps in the hope that someone would understand and reach out, it was seen as a political statement, not for what it really was. Anyway, it's something I'm still struggling to come to terms with. The result so far is that I've become hyper-sensitive to anything negative that a person might post, just in case it is indicative of a deeper malaise. It has become quite stressful. I don't know what the solution to the suicide epidemic in Western countries is (the statistics for New Zealand are particularly horrific), but I've decided that you have to make as much of an effort as you can to help people. And you know, I think I can see how wargaming could be a positive thing in this regard. A chance to get people together, a chance to introduce friends or acquaintances to something new, a chance to learn new skills, and have something you can enjoy in your own company. You have the opportunity to make mistakes, get better, put problem-solving into practice, achieve little milestones, be satisfied with your own handiwork, feel that you are making progress - but not be there quite yet, and yet that is fine - and be able to reward yourself for progress in small but satisfying ways. It's no cure-all of course, but it could be a little part of the puzzle, and may help people in need in ways we wouldn't necessarily quite understand ourselves. There's been a little more painting here over the past week or so. Some Old Glory Persian slingers. I've quite enjoyed working on these. Note the difference the dip makes (centre figure). That's a start made on my Achaemenid Persian foot, though there are about 400 more to go! Then some more figures from the American purchase. These one I've just touched up and based. I'm not a big fan of these riders. They sort of look like gormless rabbits. Functional stuff, but I think I prefer my own painting style. Well, I've just got to put in a plug for something my buddy Brad Smith of Hexsides and Handgrenades (and other things too) renown has done: he's just had his first game published, a solitaire Cold-War-goes-hot beauty called - you guessed it - NATO Air Commander. I reckon this is going to be an absolute belter of a game. 90 minutes of solitaire action defending Europe from the Soviet hordes c.1987, using a very cool card-driven resolution process. It starts on special for $40, and the international shipping is only $22 (shipping sounds bad, but if you'd lived in Japan as long as I have you'd've seen a lot worse!). Anyway, if Cold War solitaire play sounds like your thing, you can get more information on it here. Well done Brad, congratulations, and I can't wait for it to arrive! Edit: see here for my review. Would anyone have any idea what make these figures might be? They are smaller and more delicate than standard 15mm. Underneath they have the serial number 6329, and what could be an M followed by © 1978. Could they be Mike's Models, perhaps? Another batch from the recent US deal. These are Essex phalangites which were quite nicely painted already. The pikes needed straightening out and tidying up, then it was a white highlight on the linen armour and a dose of the dip. I needed to paint up and add 7 other figures from my Old Glory command set (the gift that keeps on giving!) to make up the numbers. 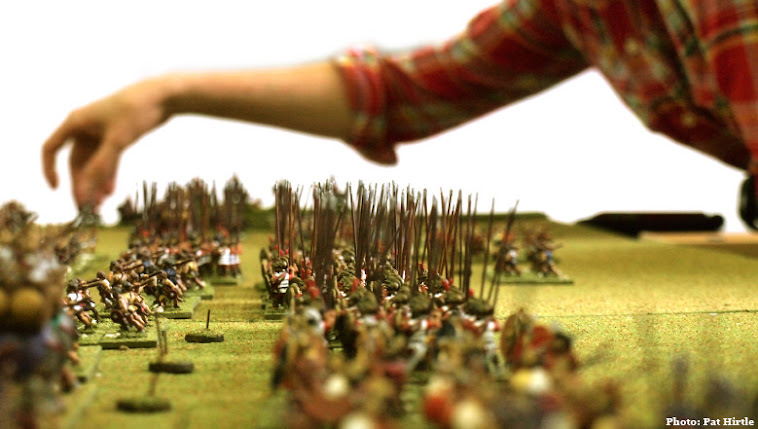 And here's a wee size comparison to some other 15mm ranges. Back in July I posted about a shipment of various already painted Italian and Greek figures I'd received from the USA. It's taken longer than I thought (doesn't it always?! ), but I've been slowly working on getting them ship-shape and based. I've been out of a painting rhythm, so it's been a bit of a struggle, even though there's not a lot to do. First step was to touch up the paint jobs so that no bare metal would be showing through. I've then given them a little brush with my magic wash, and will come back to do a few highlights here and there. I should have taken proper before shots to see whether my tinkering is going to actually make them look better! They'll be handy figures to have around, anyway. These are from the Donnington's Italian States range, codes IT32 and IT48.